Thomas S. Monson, President of The Church of Jesus Christ of Latter-day Saints, announced the Calgary Alberta Temple in the opening session of the 178th semiannual General Conference on 4 October 2008. The Calgary Alberta Temple is the eighth temple built in Canada, and the third built in Alberta. The other temples in Alberta are the Cardston Alberta Temple (1923) and the Edmonton Alberta Temple (1999).The temple is located on the northeast corner of Royal Oak Rd NW and Rocky Ridge Rd NW, Calgary, Alberta. The site has a panoramic view of the city and is adjacent to the Royal Oak Chapel in northwest Calgary. Over 18,000 members of the Church in 6 stakes will use the temple. There are 192,299 members of The Church of Jesus Christ living throughout the province of Canada. Within the province there are 7 missions, 482 congregations, 8 temples, and 166 Family History Centers. In Alberta, Canada alone there are 3 temples, 2 missions (Canada Calgary Mission and Canada Edmonton Mission), 22 stakes, 213 congregations (179 wards and 34 branches). The new Tuscany/Royal Oak rail station will be within short walking distance of the temple, facilitating access for those who use public transportation. The completion of the Calgary Ring Road, with a close exit, will make the temple accessible for those traveling by car. In the winter of 1829–30, Oliver Cowdery and Hiram Page visited Upper Canada while seeking money to finance the publication of the Book of Mormon. After the publication of the Book of Mormon in March 1830, the unbaptized convert Phineas Young preached in Earnestown. Joseph Smith, Sr. and Don Carlos Smith—the first official Latter-day Saint missionaries to preach outside of the United States, visited Upper Canada in September 1830 and preached in villages north of the St. Lawrence River. In January 1832, converts Brigham and Phineas Young went to Upper Canada to convince their brother Joseph Young to join the Church. After Joseph's baptism, the Young brothers taught their family and friends in Canada and baptized over 150 individuals and established four branches of the Church, including a branch in Kingston and Sydenham. The Prophet Joseph Smith preached in Upper Canada in September 1833 with Sidney Rigdon and Freeman Nickerson. Also in 1833, future Apostle Lyman E. Johnson preached in New Brunswick and Nova Scotia. Later, John E. Page and Apostle Parley P. Pratt served successful missions to Upper Canada. Between 1834 and 1836, Page baptized over 1,000 persons, and Pratt was instrumental in the conversion of a number of people who would later have prominent roles in the Church, including John Taylor, Joseph and Mary Fielding, and William Law. By 1850, approximately 2,500 residents of Canada, most of them from Upper Canada, had become members of The Church of Jesus Christ. Most of these members would later join the gathering of the Saints in Kirtland, Ohio, Nauvoo, Illinois, and eventually Salt Lake City, Utah. By 1861, the census of Ontario listed only 73 Mormons. Mormons first began to settle in southern Alberta, Canada in the late 1880s. Many of them at that time were contract workers on the St. Mary's Irrigation Canal, or farmers in present-day Cardston Alberta. In 1887, John Taylor, the third President of The Church of Jesus Christ of Latter-day Saints, sent Charles Ora Card, the president of the Church's Cache Stake, to Canada's Northwest Territories to establish a Mormon colony that was beyond the reach of the United States government's anti-polygamy prosecutions. Card led a group of followers and established a settlement along Lee's Creek. The settlement was eventually renamed Cardston in Card's honour. In 1895, the Alberta Stake of the Church was created, with Card as its President. It was the first stake of the Church established outside of the United States. Mormon pioneers continued to colonize what would become Alberta in 1905. Before the turn of the century, Latter-day Saints had founded Mountain View, Aetna, Beazer, Leavitt, Kimball, Caldwell, Taylorville, Magrath, and Stirling. After 1900, Mormon colonies were established in Woolford, Welling, Orton, Raymond, Barnwell, Taber, Frankburg, Glenwood, and Hill Spring. Church Apostle John W. Taylor, the son of President John Taylor, played a leadership role in assisting Latter-day Saint emigration from Utah to Alberta. In 1895, the Alberta Stake was divided in two. The Alberta Stake remained headquartered in Cardston, and the new Taylor Stake (named in honor of John W. Taylor) was headquartered in Raymond. By 1910, there were about 10,000 Latter-day Saints in southern Alberta, and in 1913 the Church began construction of a temple in Cardston. In 1924, Heber J. Grant dedicated the Alberta Temple as the first Church temple outside of the United States. In 1921, a stake was organized in Lethbridge. Stirling, one of Alberta's original Mormon settlements and a National Historic Site of Canada, was founded by Theodore Brandley in 1899, and is one of few towns in Canada plotted out by the Plat of Zion. Today, Stirling still follows the Plat of Zion. For this reason, the village is recognized as the most well-preserved Canadian example of the Latter-day Saint planning model. Ground was broken for the Calgary Alberta Temple on Saturday, 15 May 2010. Approximately 1,600 members of the Church, Priesthood leaders, government representatives, and cabinet ministers were in attendance. Elder Donald L. Hallstrom of the Presidency of the Seventy presided. Elder William R. Walker, Executive Director of the Temple Department, conducted the ceremony, and Elder Richard K. Melchin, the Area Seventy who has played a key role in the events leading to the construction of the temple at this location, was also in attendance. 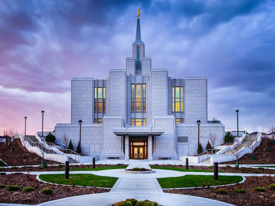 In the course of his remarks, Elder Hallstrom stated that the purpose of the temple is to "connect men [and women] on earth with God in Heaven through promises to God and faithfulness in our lives." He asked members to not just think of dedicating temples to God, but to think of dedicating themselves to God through the covenants of the temple. An open house which afforded community leaders, as well as, the general public an opportunity to tour the inside of a Mormon temple, and receive explanations of how temples are used for worship and as a House of God, was held 29 September 2012 through 20 October 2012. The open house was not conducted on Sundays. On Saturday, 27 October 2012, a cultural celebration featuring music and dance was held. The Calgary Alberta Temple was formally dedicated on Sunday, 28 October 2012 in three sessions by President Thomas S. Monson. Assisting President Monson for the traditional cornerstone ceremony prior to the dedication were Elder M. Russell Ballard of the Quorum of the Twelve Apostles, Elder Craig C. Christensen and Elder William R. Walker of the Seventy, and Temple President and Matron, Blair S. and Mary Jane C. Bennett. A choir composed of Latter-day Saints from within the temple district sang Church hymns for the dedication and cornerstone ceremony. This page was last edited on 30 December 2016, at 06:52.